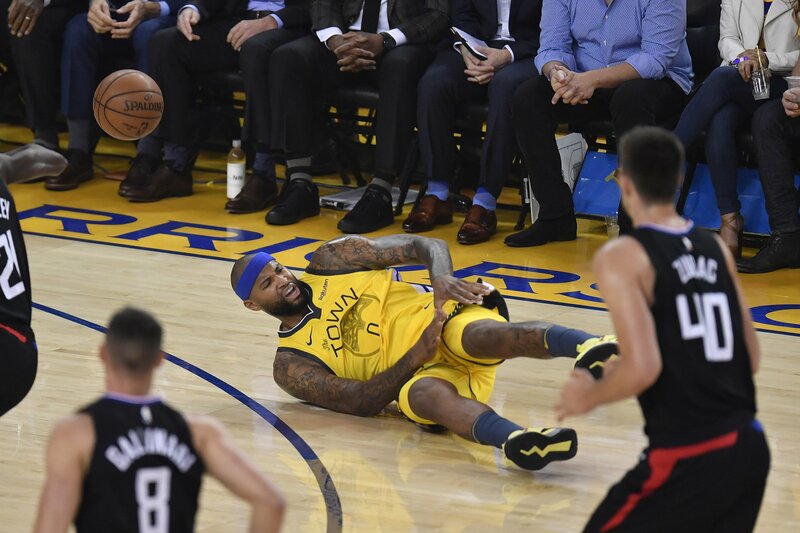 OAKLAND — Warriors center DeMarcus Cousins played only four minutes before missing all of Game 2 of the team’s first-round series against the Los Angeles Clippers on Monday because of a left quad injury. The Warriors said that Cousins plans to have an MRI within the next 24 hours. The Warriors will have more clarity on Cousins’ injury following his MRI. But Cousins’ latest ailment dampers enthusiasm over his NBA postseason debut after playing in Sacramento (2010-2017) and New Orleans (2017-18). He tore his left Achilles tendon last season in New Orleans, an injury that sidelined him for nearly a year. For over the past three months, the Warriors had become encouraged with Cousins’ progress with his conditioning, post presence and performance against the NBA’s elite centers. They also liked how Cousins, a four-time All-Star, blended his talents as a post-up player and facilitator with four other All-Stars in Stephen Curry, Kevin Durant, Draymond Green and Klay Thompson. Cousins had a rough postseason debut in Game 1, though. He finished with nine points on 4-of-12 shooting and six fouls in 21 minutes. In Game 2, he had two points off a pair of free throws and two rebounds in four minutes before his game-ending injury. The Warriors will rely on a combination of Andrew Bogut, Kevon Looney and Jordan Bell to fill Cousins’ absence in Game 2.